Instructions: Sear the pork in a hot pan coated with 1/2 the olive oil. Sear on all sides and then transfer to a plate. Add 1/2 of the olive oil to the pan. Add the pepper and shallot and cook on medium heat till slightly tender. Add red wine and deglaze the pan bringing the wine to a boil. 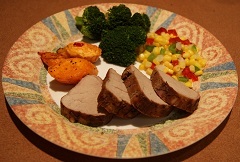 Return the pork and any juices to the pan and place in a 375 degree oven for 45 minutes. Allow to rest before carving.